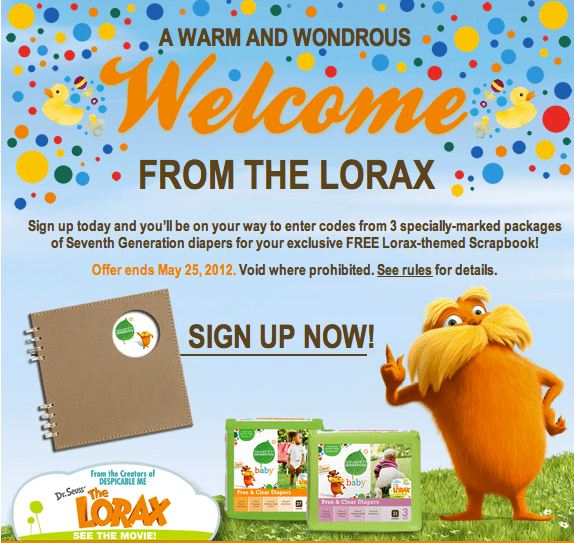 Seventh Generation has announced a new, message-focused cause marketing effort with Universal Pictures to mark the big screen debut of Dr. Seuss' The Lorax and bring a message of environmental action. Special 'Lorax' screenings will include panel discussions to underscore the importance of individual environmental actions. The campaign also features a series of special contests accessed via Facebook awarding HE washer-dryers, green cleaning kits, diapers, a trip to see the Redwoods and a town-wide eco-makeover. A Scrapbook promotion rewards customers with a commemorative 'Lorax' scrapbook after entering three 'Lorax' product codes. 'Lorax' messaging will also appear on every Seventh Generation label. We've seen a recent increase in cause-related efforts in conjunction with major motion pictures of late. This campaign is a prime example. Since an environmental cause is embedded in the Seventh Generation brand, it lends built-in credibility to this message-focused effort even without a nonprofit partner. This campaign provides retail visibility for 'The Lorax' and a novel reason to talk about new and existing products for Seventh Generation. We're waiting for cause-related products to earn product placements in future cinematic ventures. I for one, as a mom, am not too happy that they have printed the character on the “free & clear” diapers – they smell of chemicals now when they didn’t before. Couldn’t they have come up with a different way to promote the movie without printing on the diapers? Not cool, folks.